This post is really about Korean Police Officers more than anything else. 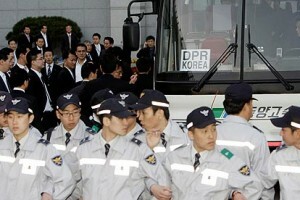 The laws have a lot to do with how the police function in Korea. Like every country, Korea has paper laws that just aren't enforced much. I won't go into these extensively, but I chose a set that are culturally unique. 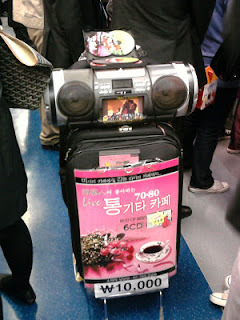 A) Buying/Selling pirated DVDs is illegal in Korea... yet if you walk around in the most popular areas of Korea, you'll find DVD sellers that look like this! In fact, ironically, if you WANT to find these sellers, you NEED to think about where the most popular places are and go there! They can be found along the main strip in Gangnam, which you know from Psy's song, or along the main strip in Jongno, which is the old central district of Korea where most of the capital's palaces are located, or in Myeongdong, which is the most famous shopping district in all of Korea. If the police want to bust these people and shut them down, all they literally need to do is take a walk down the sidewalk of any one of the most popular streets in Korea. It really wouldn't take much effort at all. B) Driving Motorcycles: With oversized loads - on the crosswalks - on the sidewalks - against traffic - is illegal. I snapped these pictures myself. Seeing this stuff is very common. 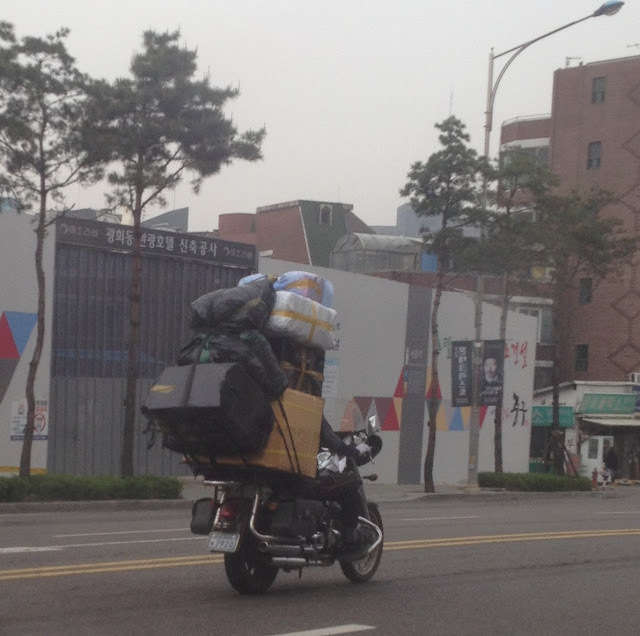 One friend of mine jokingly noted: "Motorcyclers in Korea are like homeless men on a motorbike." This law is almost never enforced, and it's not like these guys are hiding or being sneaky about it. These are broad daylight traffic violations. C) Peddling Goods in the Subway is Illegal. 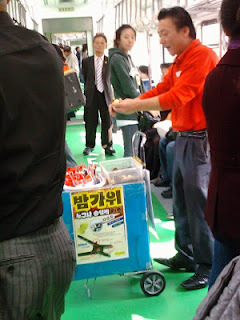 Sometimes you'll get on the subway in Korea and will be riding it, and then at some point a man or woman will get on with a little cart and try selling stuff to the passengers. The come around with a little cart and sell very cheap items. Here are some things I've seen whilst on the subway: gloves, mini LED light, socks, shoe cushions, pipe cleaner, CDs. One English teacher mentioned that sometimes the subway workers shew the peddlers away, so the peddlers just stop speaking and stand aside, then when the workers leave they start it all over again. The 3 mentioned laws that are not strongly enforced in Korea have one major thing in common. They are all laws commonly broken by the poor. Korea's economy has grown so large, so quickly, people were just left in the dust. There's no avoiding it. It's amazing to consider that Samsung is one of the world's leading manufacturers distributors, and innovators of some very popular technologies. While most Koreans have high speed internet, today, older generations can still remember living among trash and rubble from the war, scraping to get a bowl of rice. Police officers don't WANT to enforce those laws on the poor. To do so would be a form of oppression. They feel so sorry for those poor Korean people because it's the way they need to make money and earn a living... so they let it go. My experiences with foreigners have led me to conlcude that there is a dominant feeling of disrespect and disregard for a Korean police officer's job. "They're glorified security guards," says one person. Nevertheless, they are capable. 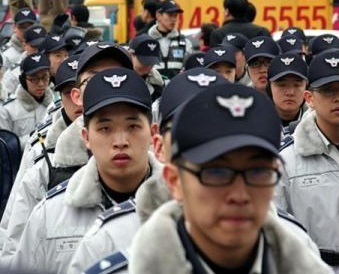 As all Korean men are required to do 2 years of service in the military, many young Korean men are doing their service in the law enforcement. This also means that, while guns are illegal in South Korea, all Korean Police Officers are trained soldiers of the Korean armed forces. Here's a recent example of an incident which happened where an American GI went rampant committing dumb crimes and a Korean police officer ended up pulling a gun and shooting him, hitting him in the shoulder. If you have done something that is obviously disrupting people around you (selling things or parking your car in the wrong place), they will step in. If they receive complaints from people about what you're doing, they will act on it. I know somebody who parks his car in the same place every day, illegally. Every day, the police walk past. One day, we were talking to the police about the car, asking questions, and they asked if we were complaining and wanted that car to get a ticket. We said no! So they nodded and kept walking. If the people don't care about the laws being broken... the police don't care either (as long as it's not a danger or obstruction, of course). 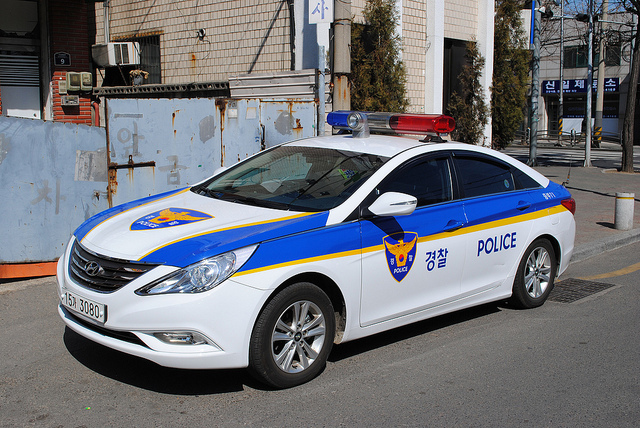 Even Korean cops like donuts.